Imagine a remake of the 1958 classic “Thunder Road” in which Robert Mitchum sped around in a souped-up hot rod complete with a custom tank for transporting illegal moonshine. Today, the Mitchum character might be tempted to pour that moonshine in the gas tank instead. Ethanol is known by many names. To chemists, it is ethyl alcohol or grain alcohol, made by fermenting almost any material that contains starch or sugar. Most ethanol today comes from corn, wheat or switchgrass. 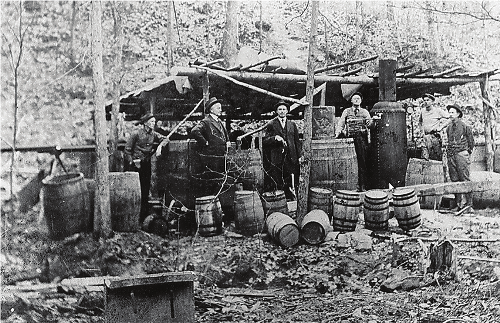 Connoisseurs of mountain-made bootleg liquor will know ethanol best as moonshine, white lightning, fire water or old stump hole. At 190 proof, ethanol packs quite a wallop. Be warned – ethanol made for fuel is automatically denatured by adding a small amount of gasoline, making it unfit to drink That 95 percent solution is then further diluted with gasoline to fuel motor vehicles at E10 and E85. Some environmentalists believe that ethanol will help keep our water and air clean. Others insist that the environmental stress of producing it far outweighs the advantages. Government leaders trumpet its glories as a renewable energy source and a hedge against rising fuel prices. Farmers love it for obvious reasons – higher crop values. Unfortunately, firefighters are like soldiers when it comes to such massive shifts in public policy. Decision makers rarely consult the folks on the front lines before taking action. Ethanol can presents serious problems for emergency responders. Techniques and resources that have proved effective against hydrocarbon fuel fires such as gasoline simply will not work when applied to a polar solvent such as ethanol. A bushel of corn processed yields 2.5 to 2.7 gallons of ethanol and various by-products. Right now, the U.S. produces about two billion gallons of ethanol annually. Legislation signed into law in December calls for a minimum of 9 billion gallons of ethanol to be used nationwide in 2008, 20.5 billion gallons by 2015, and a total of 36 billion gallons by 2022. Adding ten percent ethanol to gasoline increases its octane by three points, meaning increased performance. The increased oxygen content that ethanol provides ensures that the gasoline burns more completely, reducing tailpipe emissions such as carbon monoxide. Back in the late 1800s, ethanol was widely used as lamp fuel. During the energy crisis of the 1970s, gasoline containing ethanol was marketed as “gasohol.” Ethanol’s new demand stems largely from the decision of many states to stop allowing Methyl Tertiary Butyl Ether (MTBE) to be used as a gasoline additive. MTBE makes up about 10 percent of every gallon of gasoline with which it is blended. More than 200,000 barrels of MTBE are consumed every day in the U.S.
With regard to toxicity, MTBE is not classified as a hazard to the environment. But because it acts as an emulsifier, MTBE increases the solubility of other harmful components of gasoline, such as the known carcinogen benzene. Those components are now being found in groundwater. Even in small quantities, MTBE makes water taste bad. Unlike MTBE, ethanol reportedly does not pollute groundwater. As a fuel, it is sold at the gas pump in two forms. E10 is a blend of ten percent ethanol with 90 percent unleaded gasoline. This blend is safe to use in any motor vehicle. E85 is 85 percent ethanol blended with 15 percent unleaded gasoline and can only be used in specially built vehicles. Unfortunately, getting ethanol to the gas pumps is not as easy as gasoline. Because ethanol absorbs water it is highly corrosive to steel, meaning it cannot be put into steel pipelines. It is estimated that if 10 percent of ethanol was blended with every gallon of gasoline used in the U.S., it would put about 4,000 truckloads of 95 percent pure ethanol on the road every day. By 2010, as many as 350,000 railcar loads of ethanol are expected to move across country. Much of that new traffic is going to be in rural areas where new ethanol production facilities will locate to best take advantage of the crops. Fire departments covering these areas may be the least likely to be able to invest in effective means of dealing with ethanol spills and fires. Blended or not, ethanol is highly flammable. Pure ethanol has a flash point of only 55 degrees F. Unlike alcohol, it has a visible red flame that is almost smokeless. Add 15 percent water and the flashpoint rises to 68 degrees F. Diluted to a 24 percent solution, ethanol has a relatively low flash point of 97 degrees F.
Even at amounts as low as 10 percent, ethanol remains combustible. To dilute a 10,000 gallon ethanol spill to that amount means finding 100,000 gallons of water quickly. The problem is that lab tests show ethanol diluted to a higher percent still burns steadily. However, in the case of small spills, washing it away might be the only option. Absorbent materials designed for hydrocarbon spills leave ethanol behind as if it were water. Forget about bioremediation, fire foam that degrades harmful or hazardous materials into less harmful or benign components. Ethanol kills the bugs that eat the bad stuff. 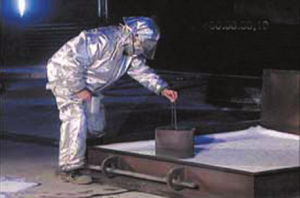 Based on the results of a two-week blind testing program conducted by the Ethanol Emergency Response Coalition (EERC) in February 2007, foams without an alcohol resistant polymer are unsuccessful in extinguishing the 95 percent pure blend of ethanol shipped to distribution terminals by rail car, truck or barge. The same is true for E85 and E10. For a typical hydrocarbon fuel fire, the remedy is to apply either alcohol-resistant aqueous film forming foam (AR-AFFF), alcohol resistant fluoroprotein foam (AR-FP) or alcohol-resistant film fluoroprotein (AR-FFFP). However, traditional non-alcohol resistant foams that are otherwise effective on gasoline and other Class B liquid fires are not effective on ethanol. Differing opinions on the issue were the driving force behind the EERC research project to determine through scientific analysis the most effective methodology for responding to a spill of fire involving ethanol. The EERC consists of the International Association of Fire Chiefs, Ansul Fire Protection, Industrial Fire World magazine, Renewable Fuels Association, Independent Liquid Terminals Association, Virginia Department of Emergency Response, Williams Fire and Hazard Control and the U.S. Department of Transportation. 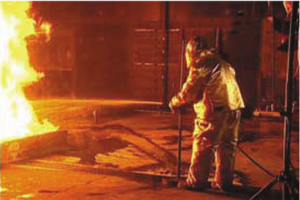 The EERC testing program used UL 162 test methodology within a scientific test environment provided by the Ansul Fire Technology Center in Marinette, WI. Forty-three individual tests were conducted on denatured alcohol, E95 and E10. Three foam application scenarios were used. The Type 2 scenario involves directing a stream of foam solution against a vertical surface simulating a foam chamber and creating a more gentle application across the fuel. The Type 3 scenario involves a foam stream directed onto the burning surface of the fuel as with a monitor foam stream. Also, a sprinkler application as would be found at a truck loading rack was used. Every test consumed 55 gallons of fuel with both E95 and E10 tested. The fuel had to be a minimum of 50 degrees F before ignition. Once ignited, a 60 second pre-burn period was observed for the type 2 and 3 tests, allowing the volume of the fuel to heat. Sprinkler application only required a 15 second pre-burn. If the foam was able to extinguish the fire, it was put through a burn back test to evaluate the foam’s resistance to fire. Using a round cylinder inserted into the foam blanket spread across a 50-square-foot-pan, a technician scoops out a portion. Then the cylinder is re-ignited and removed to determine the fire spread. After five minutes the foam blanket is inspected. If the foam blanket has deteriorated by 20 percent since re-ignition, the foam failed the burn back portion of the test. But if the foam has not lost 20 percent of its coverage, it passes. 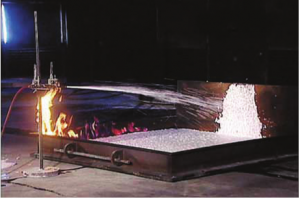 Using the Type 2 application, only one of the six foams was able to extinguish and pass the UL 162 burnback test for denatured ethanol fire and extinguish the test fire – alcohol resistant AR-AFFF. None of the foams extinguished an E-95 fire with a Type 3 topside foam application similar to a fire department using a monitor nozzle. Only the AR-AFFF and the conventional AFFF extinguished the 10 percent ethanol fire with a Type 3 monitor application at the UL specified application rate. But only the AR-AFFF could pass the burnback portion of the test and this required an increased application rate. Technically, this failed the UL test but still achieved the required results. Two foams were able to pass the UL 162 sprinkler testing on ten percent ethanol – AR-AFFF and conventional fluoroprotein foam. The alcohol resistant film forming fluoroprotein foam failed the sprinkler test on a 10 percent ethanol fire, as did the conventional AFFF, Class A foam and an emulsifier. Regardless of the manufacturer or brand, chemically these tests verified that if the foam does not contain an alcohol-resistant polymer to create a protective coating between the foam and the fuel it will not effectively put out a large ethanol fire. The NFPA Fire Code states that foam used in a loading rack must be able to extinguish or control any fires resulting from any types of fuels handled at the rack. If you have a loading rack that handles ethanol at 10 percent or more you have only one choice as to the foam that will meet code standards. Is a dry chemical system effective against a loading rack fire involving 85 percent ethanol? The answer is yes, but only if the system is correctly designed, installed and maintained. If the dry chemical system would work on gasoline, it will work on ethanol. To dry chemical, both are nothing more than a flammable liquid. If firefighters respond to a tanker that may have 10 percent or more of ethanol or all ethanol blends, they only have one type of foam that will be effective, according to the test results. If you have a tank on fire with ethanol at 85 percent, the only way to extinguish that fire is with topside fixed systems as per UL tests. Using monitors may not work on fully involved ethanol tank fires. Some foam companies are working to improve this situation, but currently there is no effective solution. Subsurface injection will not work with 10 percent or more ethanol fuel. The results indicate that AR-AFFF was the only foam agent that successfully passed the UL162 tests against both E10 and E85/95. While some of the other foams may have some degree of effectiveness, depending on the situation and their application rate, the tests confirmed that AR-AFFF will be the most effective foam for fires or spills involving ethanol-blended fuels. These tests are not intended to specify or recommend a specific extinguishing agent or extinguishing method, but rather to provide factual, science-based information about what extinguishing agents and methods were shown to be the most effective in combating fires involving ethanol according to the UL162 test methodology. The intent is to provide information that will allow emergency responders and others to make informed decisions about the foam concentrate they choose to use based on the risk in their community. Further study is needed on how to extinguish tank storage fires involving 85% or more ethanol. In addition to participating in the testing, EERC jointly produced a video documenting the test, a technical document describing the test and a training package on suggested ways to combat these incidents. This effort describes how ethanol-blended fuels are produced and distributed and the emergency-response issues that should be considered when confronting a bulk spill or fire involving ethanol-blended fuels. Visit the EERC website at www.dtnethanolcenter.com to view the video and learn more about EERC’s efforts to support fire fighters in preparing to meet the new challenges that come with this alternative fuel source. That information is also available at www.fireworld.com.